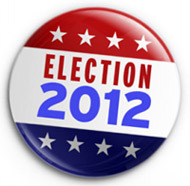 Augsburg College will serve as an official polling place for the November 6 General Election. Residents of Minneapolis Ward 2, Precinct 7—who include some Augsburg students, staff, and faculty—may vote in the Marshall Room of Christensen Center from 7 a.m. to 8 p.m. While making the Marshall Room available to the Cedar-Riverside community as a polling place is convenient for eligible voters, it does come with special responsibilities. "It's an honor to serve as a polling location for the Presidential, Congressional, state, and local races," said Ann Garvey, vice president of Student Affairs. "But it will create a different feel in Christensen Center on Election Day." That's because state law prohibits campaigning within 100 feet of a polling place when voting is underway. That means students, staff, and faculty cannot wear clothing, buttons, or stickers, nor carry signs that display political messages in Christensen Center. It also means that Augsburg staff will remove election- and campaign-related materials from areas within 100 feet of the polling location and the building. The Augsburg departments of Public Safety and Events and Conference Planning will mark the boundaries. "Auggies aren't known for being quiet. Auggies are known for their civic engagement, and for proudly wearing T-shirts and pins stating support for a candidate or position," Garvey said. "The state law isn't meant to squash the voice of individuals. It's meant to ensure the integrity of the voting process for all voters. We will make sure there are many places where Augsburg students, faculty, and staff can advocate for certain candidates and positions on important issues." Garvey said that individuals who wear campaign buttons or shirts within 100 feet of Marshall Room will be asked by federal election judges to remove the buttons, turn shirts inside out, or to put a jacket on over their attire. "We were joking that we might offer robes to those who enter Christensen Center in violation of the law," Garvey said. "But it really isn't a joking situation. We don't want our students accidentally running afoul of a law that carries real consequences when they really should be seeking to exercise their right to be heard through the voting booth." Students who live in Augsburg College residence halls and consider the residence halls "home" may vote at the Marshall Room. "The College provided the election board with a list of students who live in the residence halls," Garvey said. "This means students who consider campus their home—and who aren't voting elsewhere—are considered registered to vote." Students who live in the residence halls and are on the student list must show their Augsburg College identification to vote, according to Judy Schwartau, City of Minneapolis election specialist. Schwartau said that students living nearby, but not on the residence hall list, might rely on their Augsburg College ID plus a fee statement that has the College's address on it. Visit the Minnesota Secretary of State website to confirm or find your polling location. As an official voting location, the Augsburg College community should expect voter lines ranging in size from 200 to 800 people. Because serving as a polling location is such a large task, student volunteer groups and staff from Public Safety, Events and Conference Planning, Campus Activities, and other departments will be heavily engaged in the day. "We will have student volunteers from Day Student Government and participants from Emerging Leaders Program to help visitors to campus find the polling location and to help answer basic questions on getting around campus," said Michael Grewe, assistant director of Campus Activities and Orientation. Who is eligible to vote on campus on November 6? Christensen Center's Marshall Room is the official polling place for the November 6 General Election for those living in Minneapolis Ward 2, Precinct 7. This means those students, staff, faculty, and neighborhood residents who live in the precinct may be voting in the Marshall Room. Individuals only can vote from the precinct in which the voter "resides." Your residence is the place you consider home, from which you have no intent to move. For instance, a college student who considers his or her Augsburg College campus residence as "home" may vote at the official polling place that corresponds to that address. If the student considers his or her parents' address (or some other address) as "home," he or she must vote at the official polling place for that address. Of course, individuals only can vote once in each election. According to the election specialists at the City of Minneapolis, students living in the residence halls must bring their Augsburg College ID. Students living nearby, but not on the residence hall list, might rely on their Augsburg ID plus a fee statement that has their local address on it. You can check your registration prior to Election Day. If you had not been registered, the deadline to preregister was Oct. 16. Minnesota has same-day registration. If you missed the deadline to pre-register, you may still be able to vote. In Minnesota, individuals may register at the polls on Election Day by providing one of the proofs of residence required by Minnesota law. Please allow extra time at the polls to register. Any voters who have moved or changed their names since they last voted must re-register. More information is available on the Minnesota Secretary of State website under "Elections & Voting." What do I need to register to vote the day of elections? According to the Minnesota Secretary of State website, if you are not registered to vote or need to update your registration information, you may do so at your local polling location on Election Day as long as you can provide proof of residence. – Students living nearby, but not on the residence hall voter list, might rely on their Augsburg ID plus a college fee statement that has their local address on it. The full list of valid proof of residence is available on the Minnesota Secretary of State website on the "Same Day Voter Registration" page. A list also will be posted at the polling place. To ensure, however, that same-day registrants' wait is as short as possible, please visit the Secretary of State website in advance and bring appropriate proof with you to the voter registration desk. Augsburg College students can bring their Augsburg photo identification as a proof of residency. Names of students living in the residence halls already has been provided to the City of Minneapolis Elections Board. Are there special restrictions in place at polling locations on Election Day? Yes. State law will impact any Election Day visitor to Christensen Center, whether the visitor is there to vote or for any other reason. – Students, staff, and faculty cannot wear clothing, buttons, or stickers, nor carry signs that display political messages within 100 feet of the Marshall Room in Christensen Center. – No campaign materials or signs can be posted in or within 100 feet of Christensen Center. – Individuals also are prohibited from asking, soliciting, or trying to persuade a voter about how to vote when in a polling place. Elections officials and Augsburg College are committed to providing a neutral environment for voters, so please be mindful and respectful of conversations and behaviors that could be perceived as political in nature. Voters may take sample ballots from the newspapers or campaign flyers into the voting booth for personal use, but they should take care not to display these materials outside of the voting booth. These prohibitions also limit where meetings and other activities can be held in polling place sites with multiple rooms. What can happen if I violate any of the state laws related to campaigning within 100 feet of a polling place when voting is underway? According to a July-August 2010 article from Minnesota Cities magazine, some violations of these polling place requirements may subject a person to serious criminal prosecution under state and/or federal law. Certain egregious conduct may be charged as a felony that results in a prison sentence and/or stiff monetary penalties. Other violations are treated as civil issues and may subject a person to civil penalties that could amount to as much as $5,000.